UU A Way Of Life: Shall this too pass? The ten thousand things emerge from the Tao and return to the Tao. It seems, with distance, all like a dream. The interdependent web waxes and wanes; like the tide of the ocean, it comes in and goes out. We are here and then we are not. Other people are here and then they are not. The old in and out, the coming and going, the up and the down are all part of the same thing. Unitarian Universalists affrim and promote the responsible search for truth and meaning. With this search to find that Truth, we find it is not in the manifestation of the ten thouusand things. Truth is to be found in the Ground Of Our Being, in the Energy which fuels the ten thousand things. Wisdom is achieved in knowing, not the ten thousand things, but in the Tao which manifests them. Unitarian Univeralists call this Tao "the interdependent web of all existence" which abides eternally. 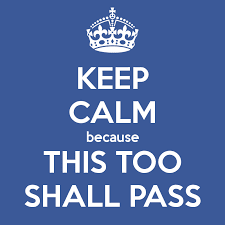 Unitarain Univeralists find calm in knowing that with whatever is going on, whatever is happening, this too shall pass.